Your headphones play many important roles in the recording process. You use them to monitor while recording and also as another reference when mixing and or mastering. So you need a solid pair that will last you for years. 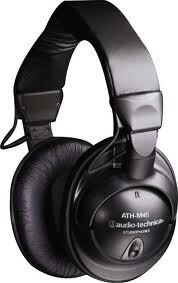 The Audio Technica ATH-M45 Studio Headphones are a pretty solid pair of headphones with excellent sound quality. They have a flat frequency response and reproduce sound very accurately. They are superior for mixing and mastering. They are built specifically for studio work and you will be surprised at how great they sound. Another good thing is the company made it easy to service these headphones by making it easy to replace the cord, earpieces, and drivers if needed. I have had these for a few days now and I love how clear they are. You can get them at Guitar Center for around $100.